Those interested in a CANSEE membership must go through the International Society for Ecological Economics (ISEE) registration. It is a joint membership. Please follow this link and select your joining option on the top left of the screen. The system will automatically assign you your national affiliation (or ask for clarification if it is unclear). You can also sign up for Ecological Economic news by signing up for our newsletter. 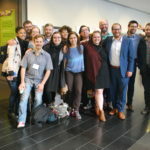 If you want to become active in CANSEE – Volunteer with us! Thank you for joining CANSEE! Join now!